This is a propulsive, visceral song for this Monday morning that makes the grind a bit more bearable. I am working alone in a small old stucco house on campus all summer, so I can turn this up as loud as I want and let it reverberate off the hardwood floors and old cool plaster walls. It lassos all the wanderlust that’s crackling in my veins this morning, the currents that always have their way with me for a few days when I return back to “real” life from my (other real life) adventures in faraway cities. I don’t know much about Frank Turner, except for that he is British, he’s toured some with The Gaslight Anthem, and that this song makes me feel a burning in my belly. It’s reminiscent of an urgent anthem that I would have loved from 1995, like when Jarvis Cocker would throw his head back and wail about never getting it right when you’re lying in bed at night — but in place of the ennui of wealthy students, we find a cavalcade of fears and dreams about leaving, leaving only imprints on bedsheets. And don’t you maybe also hear a few thematic parallels in here to my favorite parts of Springsteen (“blow away the dreams that tear you apart / blow away the dreams that break your heart”)? Wordy and potent and terrific. It also makes me wish at the 3:02 mark that I had my drumkit here in my office. This song is out tomorrow his new album England Keep My Bones (Epitaph Records) which you can stream in full on his website. He is touring the States this Fall! Excellent. 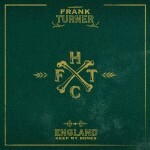 Thanks to Denver’s The Ruckus for the tip, who is having an entire Frank Turner Week to celebrate the album release. Welcome back! 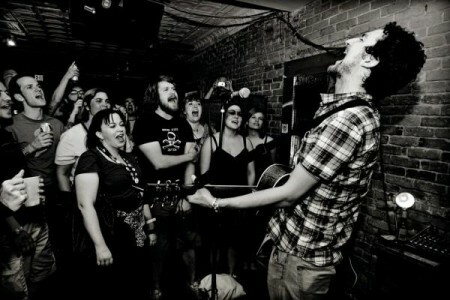 I saw Frank Turner at a teensy venue in DC a couple of weeks ago, and he was fabulous. Definitely catch one of his shows if you have the chance! Frank Turner is great, I’ve seen him many times live and he never disappoints. Give his older albums a listen. Substitute is a perfect sing-a-long song for any music lover. Been a fan for a long time-you’re one of the reasons I: a.) started my own blog, and b.) listen to The Head and the Heart. Thanks. FTHC is a tremendous talent. A phenominal singer/songwriter that crafts punk and folk seemlessly together. An all-around good guy (had the chance to meet him a few times-nicest guy in the world). Check out “Photosynthesis,” “Poetry of the Deed,” and “To Take You Home” to get you started.